She twice became the victim of an epic tattoo blunder after her attempt to get a 7 Rings tattoo ended in her sporting ink reading 'Japanese BBQ finger'. But all is not lost for Ariana Grande as she has reportedly been offered a $1m deal for laser tattoo removal to magic the problem away, reports TMZ. LaserAway, a company that specialises in hair and tattoo removal, are said to have sent the Thank u, next singer, 25, a deal reportedly worth $1.5m minimum. The deal's terms reportedly require the songstress to take part in one photo/video shoot at a LaserAway office, to be used in social media, print and viral campaigns. They are also said to be asking Ariana for one social media post in aid of the company per month for a year. The Break Free singer's manager Scooter Braun told MailOnline: 'I can't speak for Ariana as we have not received this letter, however, if they're willing to send me the offer, I'm sure I'd be happy to get a tattoo and then remove it real quick ... for $1.5 mil. MailOnline has contacted representatives for Ariana and LaserAway for comment. This comes after Ariana's attempt to correct her epic tattoo blunder ended in disaster once again as she ended up with a bizarre inking that translates to Japanese BBQ finger. 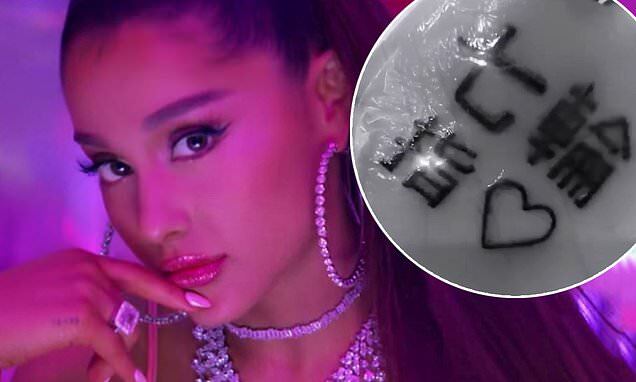 The Thank u, next hitmaker, 25, had endeavoured to fix the mistake by consulting with her Japanese tutor, who advised her to add the character for 'finger' (指) inbetween and above the original tattoo. The tutor advised that adding the character would change the translation to Seven Finger Circle or seven rings.